Home > Our History > Architecture > Artisans. Artifacts. Architecture. Trinity Lutheran Church of Detroit is designed to express this very spirit. A “Church” that is indeed, bringing out in each detail the original meaning of the Greek word Kyrieokion: The Lord’s House. Here also art finds its noblest use in the worship of Almighty God. His plan of salvation for all mankind is depicted in materials such as glass, wood, metal, and stone. 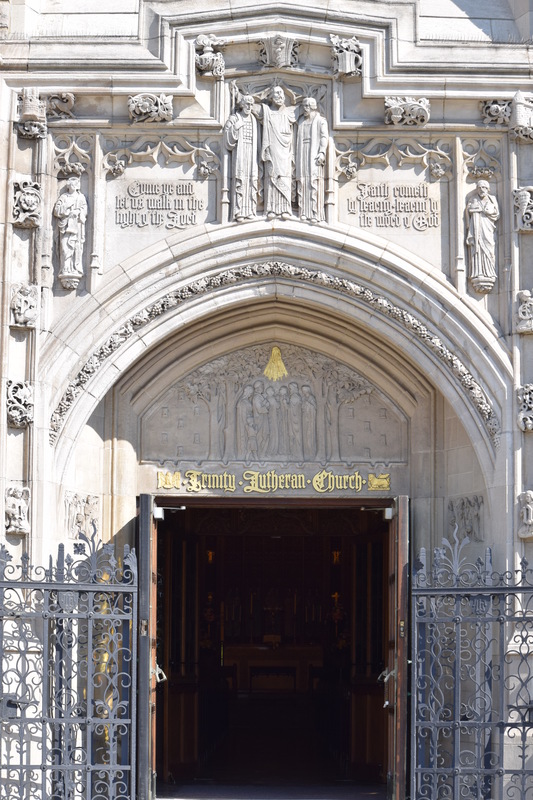 This beautiful stone structure is the third church edifice in over a century of history as the Mother Lutheran Congregation of Missouri Synod churches in Detroit. The building is constructed of multi-colored granite and Indiana limestone, with slate roof and floor, oak woodwork and stained glass. Its style is 16th Century Pier-and-Clerestory Gothic, with a triforium gallery similar to those seen in Old World cathedrals. 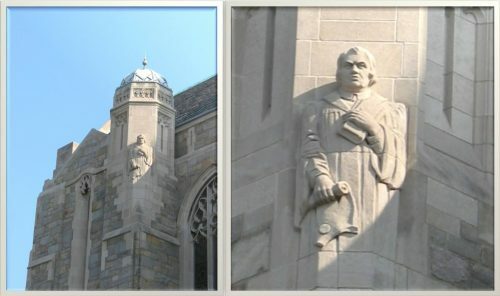 Among the three hundred figures portrayed, Luther is shown in a stone figure on a turret along the west exterior. Between each window on the west wall (the chancel is positioned north and east) various letters signify the names of Martyrs and Confessors of the Faith with the date and symbol of their death. On the hundred and four foot tower at the front, which joins the church to the parish house, there are figures of fighters for the Faith: Gideon, one of the heroic Judges of Israel; St. Boniface, pioneer missionary to the Teutons; St. Athanasius, learned defender of the Creed; and King Gustavus Adolphus of Sweden, valiant warrior for the restored Gospel. ORGAN: E.M. Skinner Company (Boston) 32 Ranks. 2126 Pipes. 5 Divisions. WOOD CARVINGS: Irving & Casson (Boston); A.H. Davenport Co.
After more than two years of planning and building, as a thank offering of members of our congregation for blessings they received. Mr. and Mrs. Charles Gauss donated the structure itself and a number of societies and individuals gave altar furnishings as gifts and memorials. The cost of the church with all its furnishings was approximately $400,000. The Altar is the focal point of all attention in the church, rising to a height of twenty-four feet, lifting the worshiping soul to the living Christ depicted in the chancel window above. The altar proper is of cream and gray colored marble with reredos of oak, both beautifully carved and adorned for the sacred purpose of celebrating the Blessed Sacrament. Reminiscent of the Last Supper, the altar rail is long enough to accommodate twelve communicants at one time. The Piscina, near the altar, is a drain into which water and wine that have been used in the Holy Sacraments are poured directly down to the ground. Brass collection plates and the receiving basin rest on the Credence Table on the other side of the altar. The Lectern, featuring carvings of the great writers of the faith, turns on a swivel. The choir and the organ are placed in the traditionally Lutheran “west” gallery. The breathtaking setting is conducive to liturgical worship. The seating capacity of the nave is three hundred; designed to remain a worshipfully intimate setting, with additional seating in the choir loft and triforium galleries. The many figures in this church were chosen from the Bible and from Church History and are so scaled and placed as not to mar the harmony of the whole structure nor to interfere with the worshiper’s concentration on the Word and Sacraments. 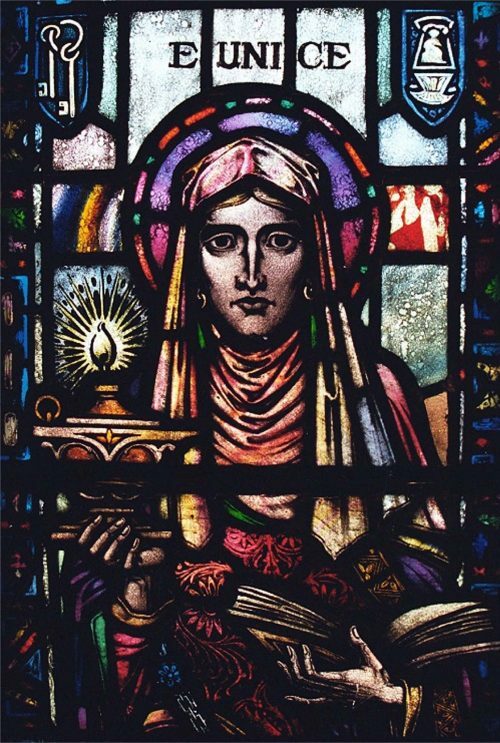 There are sixty figures in stone, sixty-five in wood, thirty-four in paintings, nine in metals, and one hundred and forty in the stained glass windows, almost all above eye-level. Symbols, i.e., pictured emblems or reminders of the Faith and Life of the Christian, are shown in the small aisle windows, the pew ends, the narthex screen, the organ screen, the chancel woodwork, the stone carving inside and outside, and in the slate floor. The narthex screen separating the nave from the narthex, or entrance vestibule, contains on each side the figures of Adam and Eve, Abraham and Isaac, Joseph and Pharaoh, Moses and Miriam, Moses and Pharaoh, the Wise Men of the East, the Holy Family fleeing to Egypt, Ruth and Naomi, Samuel and Saul, David and Jonathan, and Daniel and Darius. The top of the organ screen in the fifth bay of the nave shows figures of musicians on the heads of the posts: David and Miriam of the Old Testament; Sts. Ambrose and Gregory of the Middle Ages; and Teachers Huser and Plumhoff, former organists and parochial school teachers of our congregation. The fifty-foot stone pillars supporting the roof and adorned with these figures from the history of the church at large and of our congregation: East wall, Luther, the Reformer of the Church; Wyclif and Huss, pre-Reformation martyrs; Princes Frederick the Wise and John the Constant of Saxony, influential friends of the Reformation; Melanchton and our Rev. G. Schaller, educators; Charles Gauss and Theodore Lamprecht, Lutheran laymen; Bach and Gerhardt, composers; west wall: Dr. Walther, founder of our Missouri Synod; L. Harms and Wyneken, promoters of missions; Holbein and Duerer, artists; Francke and Buenger, welfare workers; Pastors H.C.F. Otte and J.S. Huegli, the men who served Trinity Congregation long and faithfully; Dr. W.H.T. Dau and Pastor G.T. Otte, two sons of this congregation. The leaded, stained glass windows on the east side of the church contain Old Testament figures: Abraham, Moses, Job; Samuel, David, Solomon; Jonah, Daniel, Nehemiah, Joel, Isaiah, John the Baptist. 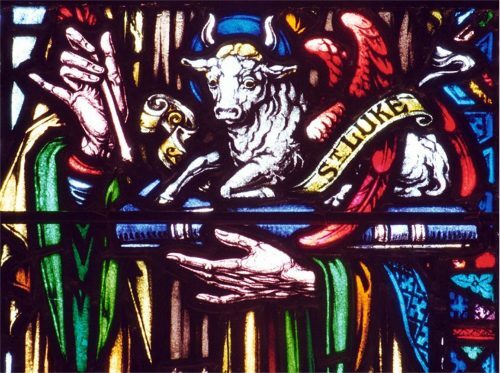 The windows on the west side show New Testament characters: Sts. John, Paul, Peter; Luke, James, Matthew; Philip, Thomas, Bartholomew; Barnabas, Eunice, Timothy; Philemon, Stephen, Jude. The window over the choir gallery depicts the Vine and the Branches, or Christ as the life of the church. In the lower row, straight across, figures representing many people looking up to Christ portray the truth: “Unto Him shall the gathering of the people be.” Above this, flanking the figure of our Lord, the second row presents a group of Apostles and Church Fathers; the third row, Reformers; the fourth and top row, more recent church workers, such as Drs. Walther, Muehlenberg, and Krauth. Amidst the intricate stone carving at the top of this large window, the heavenly Jerusalem is shown with the Saviour on His great white throne. While sitting in the pew, the worshiper lifts his eyes to the richly colored portrayal of the Resurrection and the Ascension of our blessed Lord in the chancel window. The Baptismal Font stands in a side chapel and is made of Botticino marble, with an oak cover and a brass ewer. The Baptistry window depicts the Baptism of Christ in the Jordan River, and the Parvis window at the base of the tower shows Ruth, the forerunner of Gentiles who were brought into the family of God’s people. The Altar shows our Lord in the center of the reredos holding the Gospel-encircled world in His almighty hand. Old Testament figures stand at His right and left: Moses, David, Solomon, Samuel, Elijah, Hilkiah, Josiah, and Aaron. In the lower panel directly behind the Crucifix, the Holy Apostles are shown in paintings of rich colors and again high above at the top of the reredos in woodcarving as martyrs now in glory. The four Holy Evangelists with their symbols (a man, a lion, an ox, an eagle) may be seen at the top of the four posts of the reredos. The four Archangels, Michael, Gabriel, Uriel, and Raphael, are shown in stone figures ten feet tall behind the altar and adjoining the chancel window. Preachers of the Old Testament era, Job and Elijah and of the New Testament, Sts. John the Baptist and Paul; and one of the Church Fathers, Bishop Chrysostom, grace the stone pulpit; and writers of Bible books, the lectern, Samuel and David, St. Luke and St. Peter. Melchisedek, Aaron, Ezekiel, and Ezra are shown on posts along the east wall chancel paneling and St. James, St. Mark, St. Stephen and Bishop Polycarp along the west. Cherubim and Seraphim holding vestments and instruments are shown high up on the richly decorated chancel walls, while below them are the coat of arms of the signers of the Augsburg Confession, the restorers of the faith of the Apostles and Prophets.